Most of us, if asked, would usually express a preference for natural remedies over prescription medications. Naturally. We know that these remedies are kinder and gentler, safer and have fewer side effects. What happens in between understanding this basic concept and putting it into practice? How can we make use of natural medicine so that we can get off the not-so-merry-go-round of antibiotics, steroids, suppressants, and our general state of over medication? Natural medicine works by adopting a somewhat, shall we say, philosophical approach to illness and health, taking into consideration all of the lifestyle, genetic and circumstantial factors that contribute to an individual’s state of health and utilizing these factors to help them regain and maintain their greatest health potential. This involves an investigative process of thinking backwards towards an understanding of the what, where, when and how of a problem beyond the generally accepted concept of, “I was exposed to the flu so therefore I got it”. What we are more interested in than who you are around is where is the chink in your body’s armor. A cold or flu can usually be traced back to some change in diet, lack of rest, or other basic lifestyle practice, which may not serve your body’s needs. The question to ask when you get sick is not, who gave this to me, but how have I been allowing stress and toxins to accumulate in my body and deplete my health? As a result, natural health care relies somewhat less on technology and heroic lifesaving measures and more on replacing bad habits with beneficial ones, and helping the body to help itself. This is much less dramatic and exciting than drugs and surgery. In the scheme of our health and health care, drama is best avoided at all costs. The maxim here is to strive for the greatest degree of monotony possible, in this way making more energy available for the many other dramas in life. The body is continually rebuilding and repairing itself. We have a new body every few months in terms of cell turnover rate. The body recreates itself using several very important building blocks from the foods we eat. These are the vitamins, minerals, and certain fats and amino acids, also known as “essential nutrients”, since we are unable to produce them in our body’s own chemical factory, yet they are necessary for life. At the very least this aspect of our existence keeps us connected to the physical world, a small detail that we often tend to forget. In order for the body processed to take place most efficiently, a finely orchestrated symphony of chemical reactions occurs with each nutrient relying on the presence and precise quantities of all the other nutrients and products of body chemistry. Next to prevention the best remedy is early action. Some people’s idea of healing naturally is to “let my body take care of it”. Usually this means doing nothing, including getting additional rest, until it is too late and strong drugs are necessary. I would suggest that this approach is born of a combination of simply not knowing what to do, not “listening” to the body, and a conditioning that tells us we’re not really sick until we can no longer force ourselves through our normal workday. For some this is a desirable state of affairs which, unintentional though it may be, affords that much needed break from our too-many-responsibility filled lives, not to mention a little bit of drama. 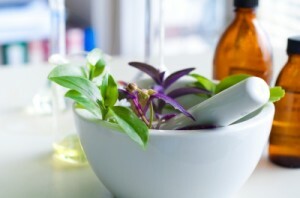 Natural medicines have a gentler, more subtle effect on the body. In order to achieve a desirable therapeutic effect through utilizing natural remedies, it is usually necessary to dose frequently so as to keep the blood and tissue levels of the substances at an optimal level. Frequently can mean from three to five times a day or as often as hourly, depending on the supplement being used, the dosage, and your own individual physiology. A paradigm shift happens here since we are accustomed to medications being quite strong and concentrated in their actions and their effects on the body. Two tablets of vitamin C will not give you the same relief from symptoms as two aspirin tablets. The aspirin has an end stage, or reactive effect (the mechanism of which remains a partial mystery to this day) at diminishing pain and discomfort while the vitamin C is pro-active and reparative in its effect. An educated patient is a health care provider’s best friend. Tinker with your diet, exercise, supplementation regimen, etc. You are a work in progress, always in a dynamic state of change and growth. This is reflected in your body’s needs as you grow and change. What worked like a charm for you before might not be the best thing right now. Utilize different methods of care to find those that work best for you. Many systems exist and all have their merits. Natural health care options can be as diverse as we are as individuals.